The Press Pot coffee we’re featuring right now is the Brazil Brauna Estate Peaberry. 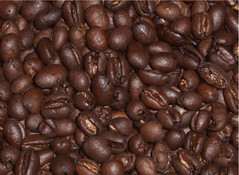 The Peaberry is when the coffee cherry has one, rather than two, seeds inside. This usually produces a more intense and complex array of flavors. Having been roasted to enhance the varietal nuances, our Brazil Brauna Estate Peaberry is a complex mixture of semi-sweet and milk chocolate, orange, and smooth nutty Brazilian coffee flavors. Come try some!